At conferences, an active engagement with the perspective of refugees and migrants is often sorely missing. More often than not, there is a lot of talk “about”, but little interaction “with” them. To give an appropriate space to their perspective is a democratic imperative. 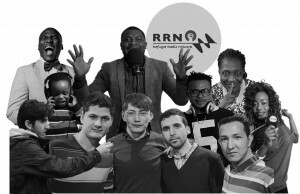 The organizers of this year’s fall conference of the German Migration Law Network were dedicated to fill this gap and invited, among others, Larry Macaulay, founder and chief editor of Refugee Radio Network, to share some thoughts about refugee empowerment. The interview was conducted by Christoph Tometten. Larry, please tell me about Refugee Radio Network. Why did you found it? What are your goals? As an activist from Nigeria, I have been active in different roles at a community level, fighting for rights and so on and so forth. When I came to Europe, to Lampedusa, as a refugee from the Libyan war in 2011, there was something missing. Citizens here in Europe did not have much information about refugees and migrants. So I started going from place to place, using theater as a medium of campaign to raise awareness about the refugee situation. Then I came to Hamburg in 2014, following the invitation of Lampedusa in Hamburg, a refugee group fighting for rights. And engaging with the German citizens as of that time, I realized they didn’t even know what was happening in Libya, they didn’t know of the Libyan war, they didn’t know about the refugee situation in Italy. So I thought: Let’s have a theater campaign in the city, let’s do some theatrical piece. And we did that successfully on Lampedusa Emancipation Day and we premiered “The Lampaduzans”. There is always a panel discussion after these events, and we were shocked by the questions. The audience was not aware of things like Boko Haram, the kidnap of girls in Nigeria by Islamist groups, they didn’t know. So, to tell the citizens of Germany and Europe about us, the real stories, and also to challenge the mainstream media because of their negative narrative of refugees – “they are terrorists, they are rapists”, that was what was in the news during that period, even until now – was the main reason to start the radio. The radio is basically there to create dialogue, because when we talk, we eliminate fears. So we are using talks to interpret and express ourselves. That’s what we do with the radio. Larry and other members of the crew at RRN. 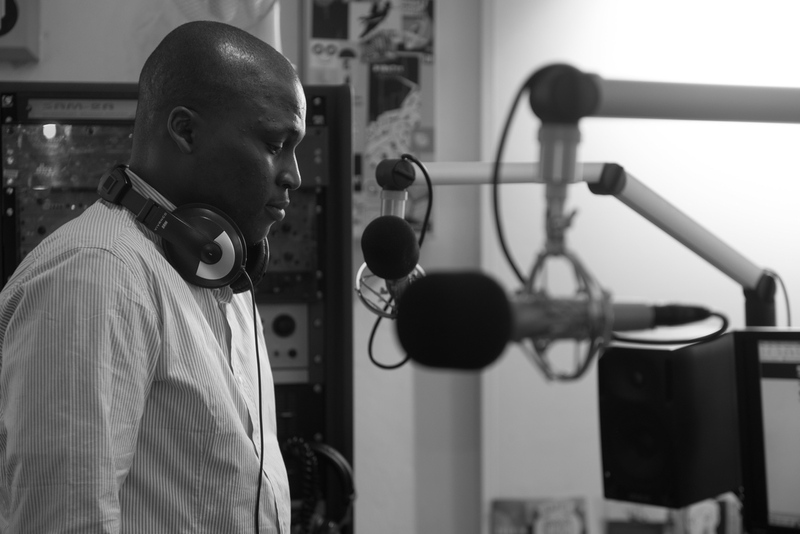 In your radio broadcasts, you interview activists, politicians, other refugees, not only in Germany but also beyond. How do you get in touch with all these people? That’s the super-heroes that we are! Actually, we just go, we occupy spaces, you know, we make our presence known. When I say we occupy spaces, I don’t mean we occupy by force. We get invited to events and we just set up our little mobile radio installation there and it becomes the side attraction for everybody in those events, they always come in and give their voice. People talk! On your website, you mention that radio broadcasting is, in essence, a human right. To what extent is your freedom of expression and information protected in Germany? You know, when we come as migrants, as refugees, we are totally pushed to the corner. It’s very difficult to survive, there is discrimination everywhere, in every aspect of life. And it’s always: no, this is not possible in our country, this is not this, this is not that. But I don’t believe in no. So I called my team and I said: we need to find the laws now, where is the Constitution of Germany, where are the European fundamental constitutional texts? I found them, and I read them through. Then I found those two provisions in the German Basic Law that says: everyone in Germany has the right to freedom of expression. In whatever format you want to express yourself, you have that right. Also, under the European fundamental rights, you have the same thing. So we placed those two principles as a guide. It’s not me that wrote it or my forefathers, it’s you guys! I am abiding by these rules and I am expressing myself. Well, the political demands are straightforward. The ideology that puts one race above the other, one religion above the other, we should try to eliminate that ideology. If we do not eliminate it, we will not succeed. You see the European countries that don’t want Muslim refugees – in 2016! This is disastrous for me. And you see how we allow right-wing movements to have more power. At this conference, we have been talking about strategies against right-wing populism and racism. Could you share some thoughts on this? You see – it reminds me of the Apartheid struggle. The ANC opened dialogue with the Apartheid government from the beginning, but the Apartheid government said no. So why can’t we talk to each other? I am an African, I am caught up in the middle of all this now. How do you want me to solve the problem? It’s the Germans that will solve the problem of racism, the problem of fascism, the problem of right-wing extremism in their country. It’s been here for a long time. How did we get to this point? How did we allow it to flourish, to grow? Huge atrocities were committed more than fifty years ago by this political ideology and we still allow those things to continue. There are tensions in society in general, and there are tensions within the refugee community, between some Syrians and some Afghans. How do you perceive these tensions? I lived in a refugee camp. You see, these tensions are a colonial import. And when I mean colonial import, colonization brought everybody together despite the fact that we are different. They sat down in Berlin and cut everything together. I am different to another man. The temperament is different, the religion is different, the way of thinking is different. There is definitely going to be conflict. And let us come to common sense: in the house, where you have a brother or sister, it is not every time that you get along, there are times when you just have some arguments. But in a refugee camp, those arguments become violent. Like the guy they shot when his child was molested and he took a knife… I still have problems with the actions that the police took, because they could have shot him in his leg, they could have shot him in his hand, but they shot him point-blank. But for me, conflict is bound to happen. We shouldn’t be surprised about it. It’s bound to happen, but how can we make it happen less? The tensions in the camps vary. It’s not one problem, it’s different problems. You need to understand the religious differences of people. Even in the prisons, they separate people, they segregate people. Of course, it’s not right, but it’s the way that violence will not erupt. So if you know there are people from Afghanistan, why do you mix them with the Syrians? People from Africa believe in Christianity, some of them. And in between that, if a Muslim is sleeping in the same room and the Christian stands up and starts praying, you know, tension can arise from there. I lived in a room with seven people. I am a Christian. And every morning, in this room, a group of Christians woke up and started singing and praying. Because they wanna pray! Of course, they have their right to pray, and of course they are disturbing me. So there was conflict between me and them. So I brought the law: nobody prays in this room anymore. We voted, and everybody agreed. If you wanna pray, go in the free room next door. And that was how we solved it. But we solved it because we were from the same country. So what if it was a Syrian to whom I was saying: you cannot pray in this room. He will go violent, of course. Because I am infringing on his rights. So these are the tensions. The way to solve it, is to create environments for certain things. If the rooms are only meant for sleeping, say: this room is only meant for sleeping. Well, it’s important that refugee and migration issues are discussed now, because for many years it was marginalized. Migrants are always marginalized, so I am happy to be here, to tell the refugee radio story and also to express what we are facing and how we can be part of a solution to it. For me it’s very simple: we are living in a time of struggle, and the struggle must continue. A luta continua, and victory is certain.